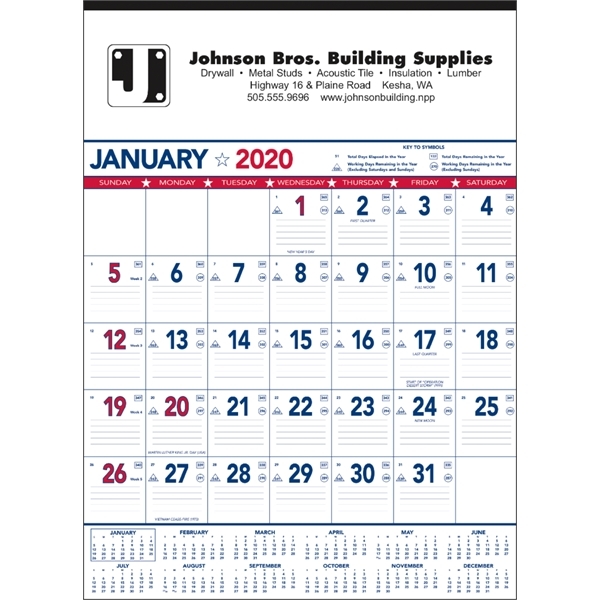 Patriotic Contractor Memo 2020 Calendar. Large numbers for easy reading plus lots of space for writing. This giant planner is used in most industries. Date blocks contain faintly ruled lines along with symbols denoting the days elapsed and remaining in the year, work days remaining without Sunday & Saturday and work days remaining without Sunday. December top sheet included at no extra charge. Grid includes Julian dates and work days remaining in the year. Top markets: manufacturing, construction, retail. Material: 50# offset. Product Size: 18"w x 25"h.
Size: 18 " x 25 "
Price Includes: one color only (same color as ad copy). Minimum quantity is 50.